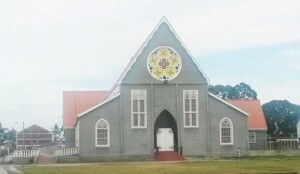 As Parishioners gathered at the St. Phillips Anglican Church early yesterday morning, three armed young men shamelessly marched onto the holy grounds and robbed them of their money, cellular phones and even their wedding bands. Kaieteur News understands that the robbery took place around 7:30am. The Priest of the Church, Oswald Barnes, was preparing for the Sunday Mass. In relating the incident, the priest said that he was in the Church’s vestry when he heard a loud noise. “When I heard the noise, I asked the Deacon to go see what all the fuss was about. He rushed back saying that there is a robbery, members getting hold up. So we secured ourselves in the vestry. I tried to climb up and peep through the vents to see if I could see what was going on but I was restrained. “The Deacon told me not to do so because they could see me and come inside. We waited in the room. The ordeal lasted for about five minutes and then they left. When I came out members of the Church started to explain what happened. It was a terrible experience. I cannot believe a robbery took place inside the church. Wow,” the Priest lamented. Father Barnes told this publication that based on what members related to him, the three unmasked men, who could not be older than 20 years, came into the church and demanded the belongings of the members. He stated that the Treasurer of the Church was also held at gun point and was asked to turn over the monies collected. “But all he got from the Treasurer was a few hundred dollar bills because that’s all he had in his pocket but they missed a brown envelope on a table that had the money inside. The treasurer was standing behind it but apparently they did not notice that,” the pastor added. Barnes asserted that he tried his best to calm members of the church who were very traumatized by the incident. He said that, nevertheless, the proceedings of the Church continued as usual. He said that the message of the day was “the Abuse of Power by leaders” but spoke a little on the worrying escalation of crime in the country. He said that the members of the congregation also prayed for the troubled young men. “We prayed for them. I think everything worked out because some of the members of the Church are licensed firearm holders and strange enough, they didn’t walk with their firearms today (yesterday) and maybe it is a good thing that they didn’t for who knows what would have played out. I don’t know how I would have taken it if there was a gun play in the church and someone was terribly injured,” the priest said. Barnes expressed, however, that although a call was placed to the police after the brazen young men left, “not a single officer turned up even after Church was over and that was an hour later”. Nonetheless, the matter was reported and investigations into the incident have commenced.